In what I sincerely hope will be a cross between Bill Nye and Mr. Wizard, only nicer (remember him? 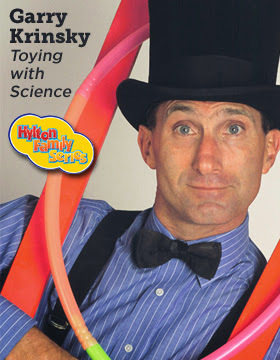 ), Garry Krinsky will be “Toying with Science” at the Hylton Performing Arts Center for their Hylton Family Series this weekend! Discover the fascinating and fun world of science! This delightful afternoon is filled with circus skills, mime, comedy, original music, and plenty of audience participation. First commissioned by the Museum of Science in Boston, this imaginative program explores scientific principles of gravity, leverage, fulcrums, and simple machines through memorable songs, witty humor, stunning theatrics, interactive demonstrations, and lively science-based toys. Garry Krinsky has educated audiences for more than 35 years with his entertaining style. His extensive theater background, non-stop energy, and animated movement has even earned him the reputation of being a “living cartoon.” The whole family will enjoy this afternoon of wonder and learning at the Hylton Center! Purchase your tickets ONLINE or register to win a family four pack by leaving a comment on this post by midnight on Wednesday, October 9th. Even though it’s a quickie, the giveaway rules still apply. When you enter, you’re agreeing to be bound by them. Not affiliated with Apple, the App Store, Android, Google Play, Facebook, etc. Prize provided by Hylton Performing Arts, winner assumes all liability and risk.